The organization Wycliffe Bible Translators is committed to translating the Bible not only into all the world’s written languages but into its visual languages as well. 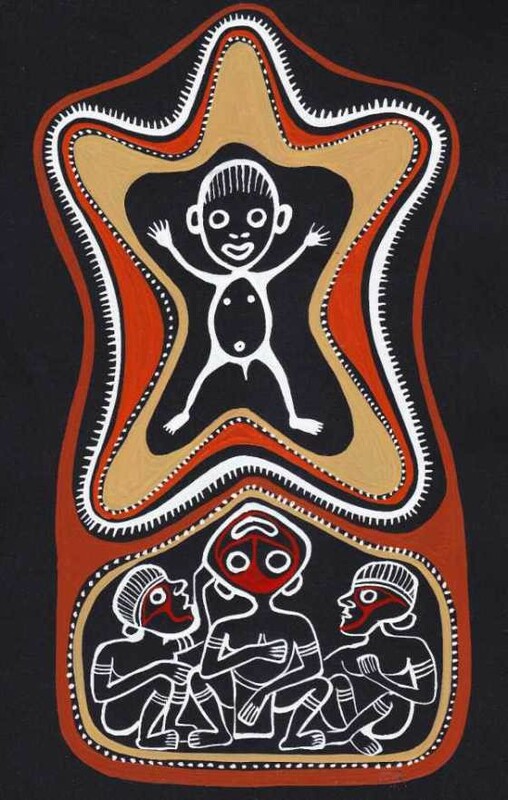 In 2011 Wycliffe missionary Peter Brook commissioned artist Nanias Maira, who belongs to the Kwoma people group of northwestern Papua New Guinea, to paint Bible stories in the traditional style for which he is locally known. Using the Kwoma palette of red, black, and white, Maira painted several pieces on the Genesis creation account and some on the early life of Jesus. When these paintings were presented to the Kwoma people, their response was, “These are ours!” They were excited to see their culture honored in the telling of the gospel and were thus more receptive to it, more engaged. Maira’s painting Ner Wiynmaiy depicts a happy, naked baby Jesus framed by the Star of Bethlehem. The Three Magi sit below in adoration of the newborn king. For more information on Brook’s role with Wycliffe and Maira’s art, see “Ethno Arts and the Gospel” on the Wycliffe website. Nanias Maira: Ner Wiynmaiy, 2011. Painting on sago palm bark. Photo: Peter Brook. Nanias Maira was born in 1975. His highest level of education is grade 8. A naturally talented artist, his interest developed in the early age of 9. He started with clay models, then turned to clay pottery. From the clay pottery he went into wood carving and then to bark painting. Painting has been his main source of revenue for almost twenty years. Most of his paintings are traditional but he also creates contemporary style painting. See http://png.spla.pro/en/ficha.pessoa.nanias-maira.49074.html.